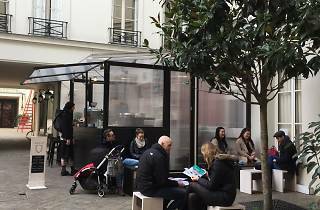 Sit down to creamy flat whites and sweet treats at Paris’s first outdoor coffee shop. Unless you’re the kind of person with thousands of euros to spend on a whim, Rue du Faubourg Saint-Honoré is probably not your regular hangout. But don’t let that deter you from visiting Paris’s first outdoor coffee shop, hidden inside a pleasant and peaceful courtyard in the 8th arrondissement. Inside their quirky self-contained stand, all glass panes and stark black frames, the English and Australian owners Daniel Warburton and Angelle Boucher prepare rich and creamy flat whites and espressos and serve luscious treats to a chic crowd of office-goers. Tucked at the back of the stand are tiny tables and chairs but the best seat in the house is on the high stools that face the counter, all the better to watch the expert baristas in action. The stand stocks donuts from new-about-town bakery Boneshaker (a real hit, they tend to sell out fast) and there are also pretty cakes from Broken Biscuits. 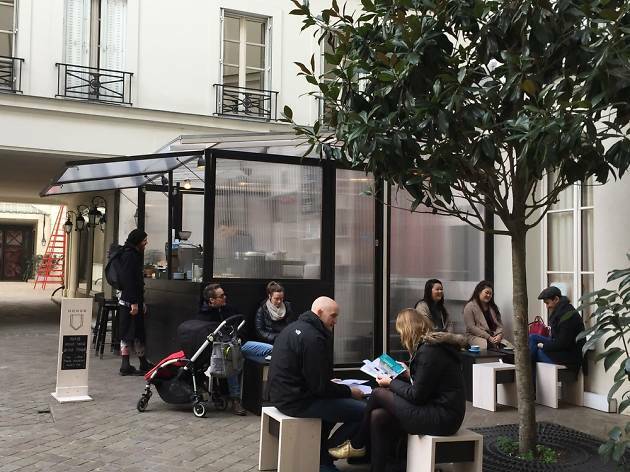 This outdoor coffee stand is located in a courtyard right off one of Paris' most exclusive shopping streets, so it is often frequented by fashionistas and tourists. I tried their iced coffee, which was delicious, and sat outside in their cute little courtyard, but that was in the summer. In the winter it definitely can't be as fun! Not somewhere I frequent on a regular basis but a good place to get your coffee fix if you're in the area.